John Skoog [left], with his son Ben, were close to having their roofing business certified for government contract work before the shutdown happened. In Newport, Wash., a city of just over 2,000 people, the government shutdown is causing growing anxiety -- over a Christmas tree. It's not just any tree. The 88-foot tall Engelmann spruce was selected as the official tree for the West Lawn of the U.S. Capitol. It's an honor for Newport to provide this year's "Peoples' Tree," said Jamie Wyrobek, director of the region's Economic Development Council. More importantly, it's an opportunity for the tiny town to generate national publicity. But the tree is in a federal forest and will be chopped down by the Forest Service, so the shutdown put those plans on hold. While the tree isn't scheduled to be felled until Nov. 1, the prep work for the ceremony usually lasts all month, said Wyrobek. "We don't know what will happen," said Wyrobek, who hasn't been able to contact anyone at the Forest Service since the government shutdown on Tuesday. "It'll be very upsetting and a big setback for our community if things are delayed or canceled." The shutdown will hit Newport in others way, too. The town is located 70 miles from the Canadian border. Home to a federally regulated river and dam, as well as more than 529,000 acres of federal forests, it's a prime area for government contracts. Over the last five years, 226 government contracts from the Departments of Agriculture, Interior and Veterans Affairs -- valued at $3.6 million -- have been awarded for projects in and around Newport, said Leslie Miller, manager with the Government Contracting Program for Eastern Washington. Newport is also certified as a HUBZone, which helps small businesses in economically disadvantaged areas gain preferential access to government contracts. This helped 105 of the area contracts go to small businesses. But small businesses in Newport that were hoping to compete for government work will have to wait until the impasse in Washington ends. 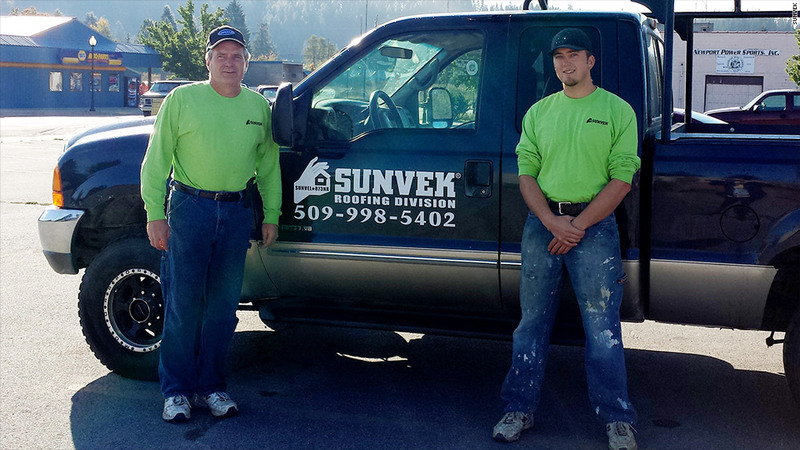 John Skoog owns commercial roofing company Sunvek in Newport. He recently decided to shift his business almost entirely to government contracts, as they're much more lucrative. A single government contract can generate $100,000 or more in revenue, compared to a few thousand dollars for corporate projects. "Also, I know I'll be paid by the government," he said. "With private work, you have to wait for a long time and sometimes you don't even get paid." He was one step away from having his firm certified as a government vendor when the process came to a standstill on Tuesday. "I don't know what to do now," said Skoog, who has a pitch meeting scheduled with the Army Corp of Engineers on Oct. 22. "I can meet with them, but they won't consider my company if I'm not fully certified." The Army Corp. of Engineers will be furloughing 370 people in the region because of the shutdown, which could further impact projects in the area. Skoog said he has no revenue coming in right now because he was confident in the government contracts, so If the shutdown doesn't end soon, he'll have to scramble for other projects. Jay Hedrick's Versatile Industries, based in the Newport area, does reconstruction and excavation work for state and federal agencies. So far, his ongoing projects haven't been affected by the impasse in Washington. "I won't be doing any new federal work [for] two or three weeks," said Hedrick. "So I'm not sure how that work will be affected. If I have to lay off workers, I will. I'll have to find a way to work around whatever happens." "Our community has benefited greatly from federal dollars," said Wyrobek. "If the shutdown continues very long, no doubt the impact will become greater on small businesses and social programs."